The Bedlington Terrier is a lively, outgoing, bold, athletic and cheerful dog who is extremely devoted to and protective of his family. He's affectionate and will jump for joy on your return home. He forms a strong bond with his family, and needs lots of attention in the form of cuddles or chances to sleep quietly next to you while you watch television. A calm dog at rest, he'll spring into action when called on to play, retrieve, or go for a walk, or when he hears a strange sound at the door. He's a good watchdog who has a knack for sizing up strangers: he'll tend to be reserved with them at first. He's good with younger children if introduced to them as a puppy. He needs to be raised with cats and other pets while still young if he's going to tolerate them. He can get along with other dogs as long as they aren't pushy (he will not back down from a challenge from another dog). He is eager to please, but can be a bit headstrong. He's a trainable dog who can be a joy to teach, but the headstrong part of him can also assert itself, and this may extend to housebreaking. He needs a daily walk and loves to run fast. He must be on a leash at all times, both to avoid challenges from other dogs and because he might chase small animals. He can live in an apartment without a yard as long as he's walked daily and given plenty of physical and mental stimulation. He likes to bark, and must be taught when "enough is enough." He sometimes digs. He is a very low shedder, and would be good pet if you want a tidy house. 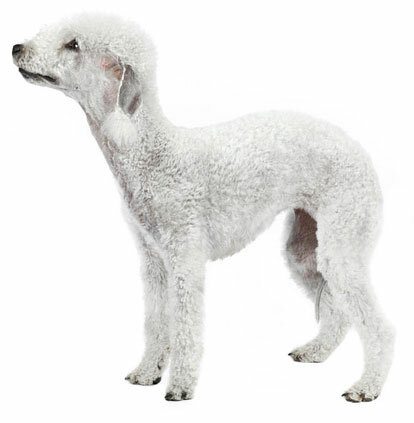 The Bedlington Terrier is 15 to 17 inches tall (to shoulders) and weighs 17 to 23 pounds. He has a long, crisp coat that is a mixture of hard and soft hair. His coat color can be blue, tan, liver, sandy or a combination of two colors. He often starts out light-colored as a puppy, and then turns darker. Pet coat: Brush occasionally and clip short every few months. Show coat: Requires 10 to 15 minutes brushing twice a week and needs to be clipped and scissored into shape every 6 weeks. The Bedlington Terrier takes his name from a mining district in Northumberland, England, but his deeper origins remain mysterious. He is said to have been used by gypsies to hunt game--thus his nickname, the "gypsy dog." In 1825 an English breeder named John Ainsley produced the first Bedlington Terrier. The new breed quickly became popular in the region, and famous for its skill in hunting badgers and rats. The National Bedlington Terrier Club (of England) was formed in 1877. His AKC popularity was 129th out of 157 breeds in 2007.